Michael Wyatt with the Louisiana Trust for Historical Preservation (LTHP) was the guest speaker at the CHPS Annual meeting held on Jan 27th. Mr. Wyatt is the first Preservation Field Services Coordinator for the LTHP. He was hired last year, with funds provided by the Wilson Challenge Grant (a 3-year Partner in the Field program funded by the National Trust and generous contributions from local sponsors throughout the state). In his presentation, Mr. Wyatt, shared the LTHP Endangered Properties List, including several from Shreveport and Alexandria. He provided some encouraging news: people are showing interest in saving some of the beautiful sites for possible adaptive reuse (including a church). The annual meeting of the Calcasieu Historical Preservation Society (CHPS) was held on January 27th at the home of Carolyn and Mary Woosley at 1401 Shell Beach Drive c. 1920. In keeping with CHPS custom, CALCA and Landmark Awards were presented, elections held for the new Board of Directors and a report outlining the year's efforts by CHPS was presented.. Also, as part of the program, members were allowed to tour the entire 3 stories of this beautiful and historic home. A.C. Boudier provided the following historical insight about this landmark home, known as "The George Law House". 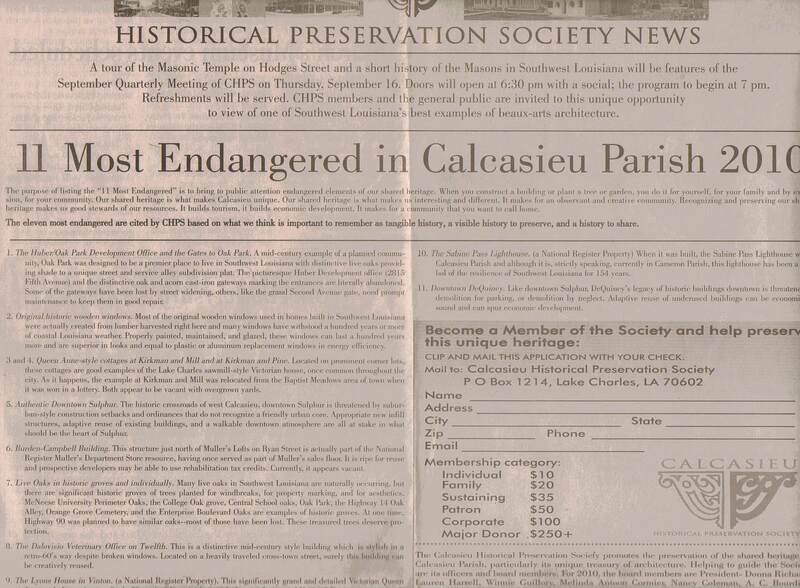 The annual meeting of the Calcasieu Historical Preservation Society will be held on Thursday, January 27th, 2011 at 6:30 PM at the Woosley Home at 1401 Shell Beach Drive. There will be a social with refreshments, a tour of the home, voting for the board of directors, and the presentation of awards and officers. 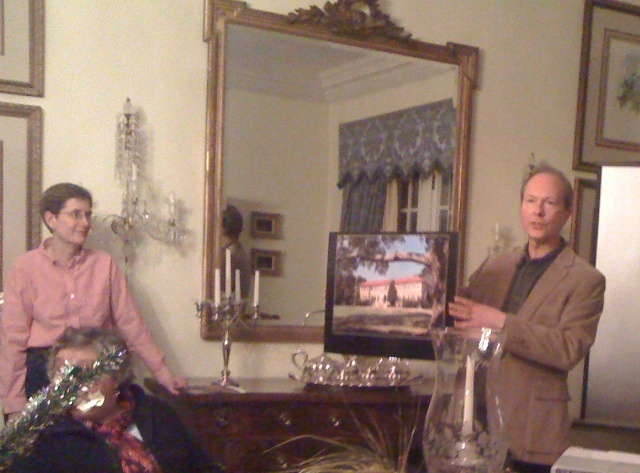 Michael Wyatt, Field Represenative of the Louisiana Trust for Historic Preservation is the guest speaker. CHPS quarterly meeting will be held at Stellar Beans coffeehouse. The Cash Grocery and Sales Co. warehouse at 801 Enterprise Blvd. has been listed on the National Register of Historic Places, said Rick Richard, owner of the structure. Richard said he was officially notified July 1 of the listing on the register, which is part of the National Park Service. “We’re thrilled to have the recognition for a place that was so important to the commerce of Lake Charles,” Richard said. 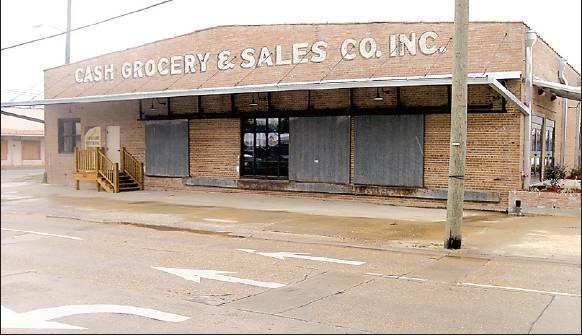 Cash Grocery and Sales is the 15th Calcasieu Parish listing on the National Register. The last building to be added was Immaculate Conception Cathedral in Lake Charles in 1994. The Cash Grocery restoration had previously been recognized with an award from the Louisiana Trust for Historical Preservation and a Landmark Award from the Calcasieu Historical Preservation Society. This month commemorates the anniversary of the Great Fire of 1910, the fire that destroyed seven city blocks in Lake Charles. Besides a recent facelift, our website offers a few new features and the promise of even more photos and content. To better showcase the beauty of the numerous historical areas in Calcasieu, a section has been dedicated to Historical areas and sites. We've started with photos of the Charpentier Historical District, Margaret Place Historical District, and Downtown Lake Charles but look forward to adding other notable areas and sites. ALEXANDRIA — Two Southwest Louisiana residents won top state preservation awards at the 30th anniversary Louisiana Trust for Historic Preservation conference. John Crook of Leesville was named Preservationist of the Year for his efforts to revitalize historic buildings in Leesville and form a preservation partnership with Fort Polk. Oliver “Rick” Richard of Lake Charles won a special preservation award for rehabilitating the old Cash & Carry Grocery warehouse at the corner of Broad Street and Enterprise Boulevard. The Cash Grocery and Sales Co. Warehouse at 801 Enterprise Blvd. has been fully restored and is ready to begin a new life as a multipurpose building. The Calcasieu Historic Preservation Society will hold its annual meeting there at 6:30 p.m. Thursday, Jan. 21, and will give a tour of the building, elect officers, present Landmark Awards and celebrate local preservation successes. Cash & Carry will be one of several structures to receive the society’s Landmark Award.The building was recognized last year with a Special Honor Award from the Louisiana Trust for Historical Preservation. Oliver G. “Rick” Richard, the current owner, said he wanted to preserve its original condition as a 1930s warehouse, a precursor to modern warehouse retail outlets. He also wanted to adapt it to a productive use to help reinvigorate a once-thriving business district on Enterprise Boulevard that extended from Broad Street to Interstate 10.